Deep Desire to Make the World a Gentler Place for Children! Call 1-515-739-1022 Code 462489# Ref. #52 Stephanie N. Van Hook is passionate about the power nonviolence and constructive conflict resolution, especially in its practical applications in early childhood education and unarmed peacekeeping. She has been working with the Metta Center since 2007, starting as our Executive Director in 2010. She is the author of Gandhi Searches for Truth: A Practical Biography for Children and the host of Nonviolence Radio, which airs on community station KWMR every other Friday at 1pm PST. 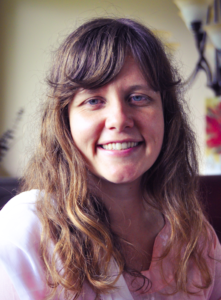 Stephanie is trained in Montessori Early Childhood Education, and draws insight and encouragement from the works of the great feminist peace educator, Dr. Maria Montessori. She is associated with the Green Shadow Cabinet, Peaceworkers and the US Peace Corps (Benin 2005-2007). In 2015 and 2016, she wrote a daily column on Gandhi’s wisdom for our times. She is a novice weaver and spinner (in the Gandhian spirit) but primarily a spiritual aspirant. She attributes her energy to her daily meditation practice and a deep desire to make the world a gentler place for children. If she knows anything at all, it is because mentors and guides have taken her under their wings. And she is deeply aware that if she accomplishes anything at the Metta Center, it’s because of the dedication and love of the entire team with whom she is honored to work.